Our 50 years of cleaning experience combined with our modern facility allows us to tailor our process to meet a wide range of specific seed requirements. SPG is fully accredited by the Canadian Food Inspection Agency as a registered seed establishment, complete with a fully accredited seed grader on staff. As a result of our rigorous attention to detail and plant cleanliness, you can be assured of complete lot segregation and purity. Cleaning common seed for growers for their own use is the keystone of our business. 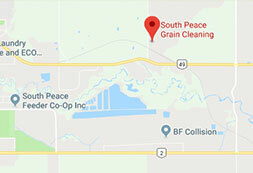 Look to SPG for all your common seed cleaning needs.